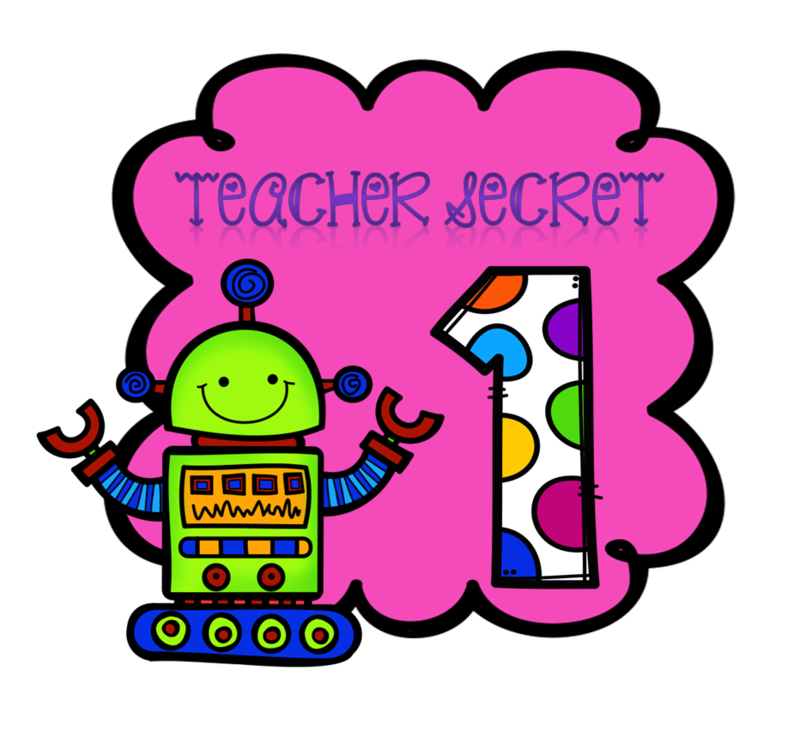 About four years ago, I was lucky to find my first teacher blog. I never knew such a thing existed! There were so many great ideas and freebies! From that point on, I became "inspired" and started making teaching my hobby. I am so thankful to other teachers for sharing their ideas and passion for teaching! It has enriched my teaching and has greatly benefited my students! I have made many friends who are as obsessed with teaching as I am. I truly believe the online community of teachers is a huge reason why I am as excited about teaching as I was when I stepped into my first classroom nearly two decades ago! 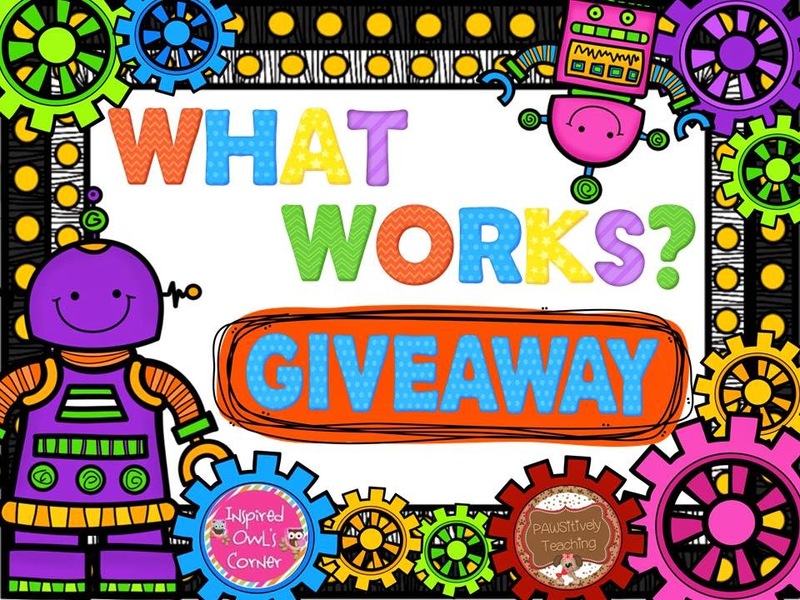 To celebrate Teacher Appreciation Week, Lisa from PAWSitively Teaching and I bring you this Teacher Appreciation Linky and Giveaway. We will share some things that have worked well in our classrooms, along with many of our friends. Be sure to enter our huge giveaways at the end of this post! 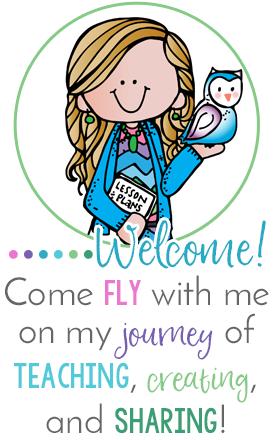 A few months ago, Tabitha (who is one of the sweetest, most generous teacher-bloggers you will ever find) from Flapjack Educational Resources contacted me about my interest in the owl version of her Smart Class Website. I had originally seen it on her Facebook page, and thought it was a brilliant idea. At first I wasn't sure though- I thought it would be one more thing to have to keep up with! Boy was I wrong! I'm so glad I decided to go ahead and have her create one for me! I was able to choose which tabs I wanted, and Tabitha was great about helping me with that. You can see below what I chose. You can visit Something to Hoot About by clicking on the owl below. It's so easy to update everything on the website! 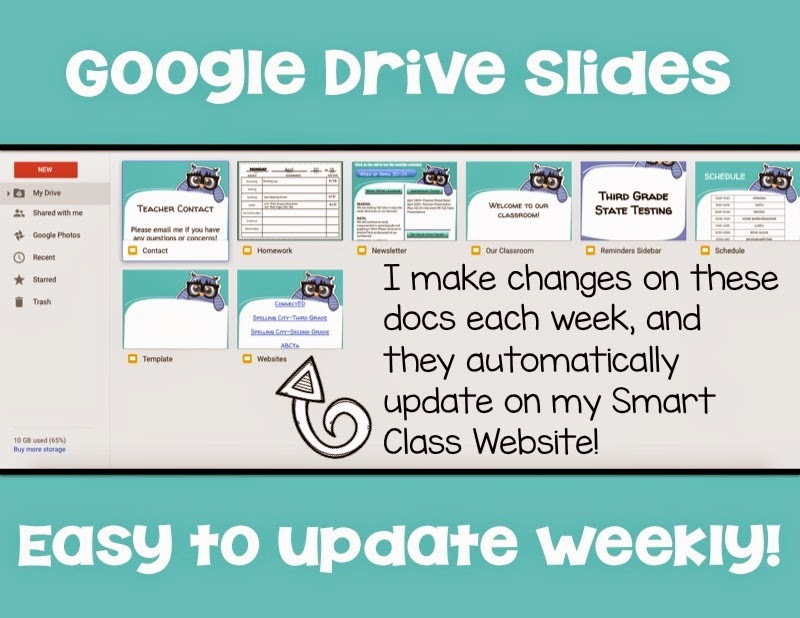 The slides are updated in Google Drive. I have never done anything like this before, and I was literally up and running minutes after she emailed me to tell me it was ready to go! When you click on each slide and type on it, it automatically saves and updates on your class website! You can see all of my slides and parts of my Smart Class Website below. I love the Weekly Newsletter. This is where I can keep parents updated about events that are taking place in our classroom or at the school. I can put classroom donation needs, special things we are studying, field trip info, and anything else that parents and students need to know. 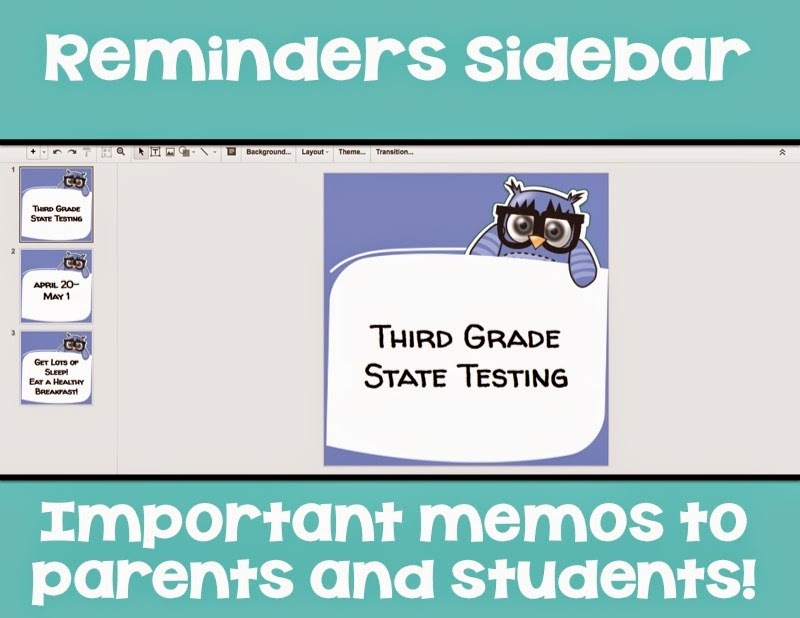 The Weekly Homework slides are especially helpful. I wish my students could be responsible and copy down all of their homework- but let's face it, they are 7 and 8 years old! This is great for those times students forget to write down their homework. Parents can check on the website, and print off a math page (on our math website), or have their child complete the spelling assignment. 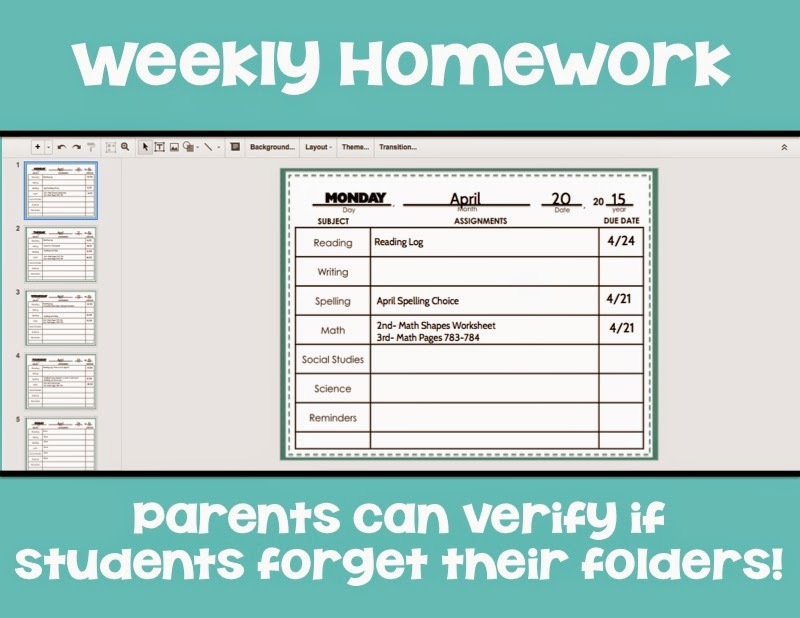 It's great for accountability when the students tell their parents "I don't have homework tonight." It takes me about two minutes on Sunday afternoon to update their homework! Students and parents love using this slide. 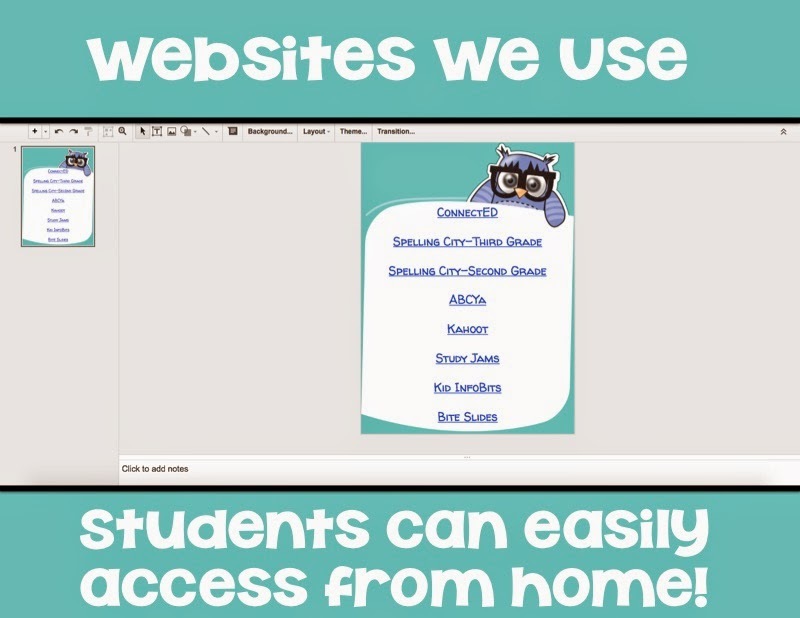 They are able to easily navigate to the websites we use in class. Many have also added them to their children's devices! I think this is my favorite part of the whole Smart Class Website! The reminders sidebar that automatically changes to the next page! This is where I put important reminders that I don't want them to miss! If you click on the owl in the Weekly Newsletter, it takes you to our monthly calendar! 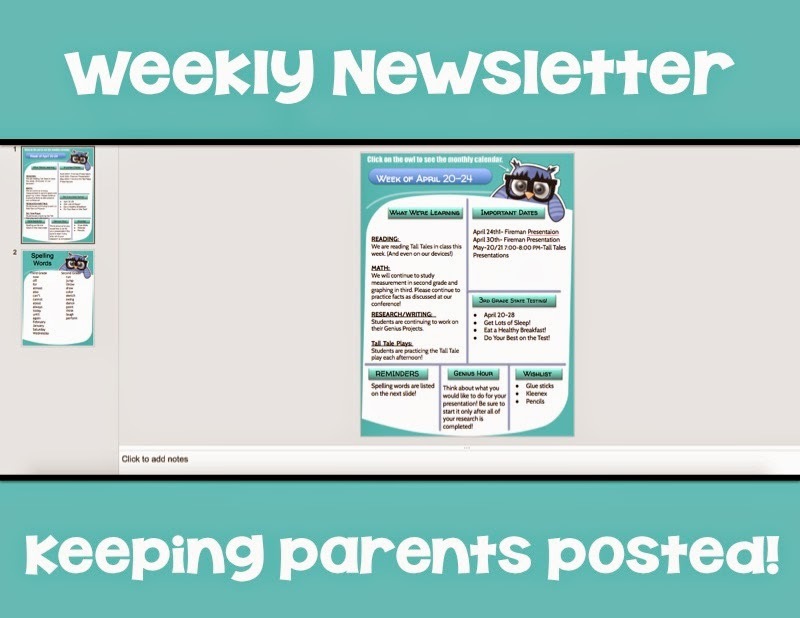 Parents can update their calendars at a glance! 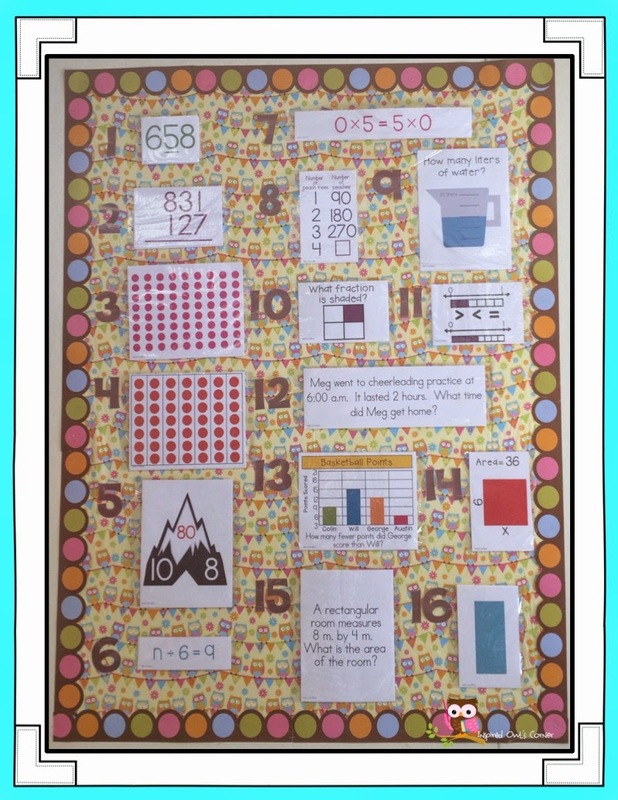 I have also started having students blog about what they are learning in class. Next year I will set up a schedule and have students blog a few times a week. I think parents would love to read that! 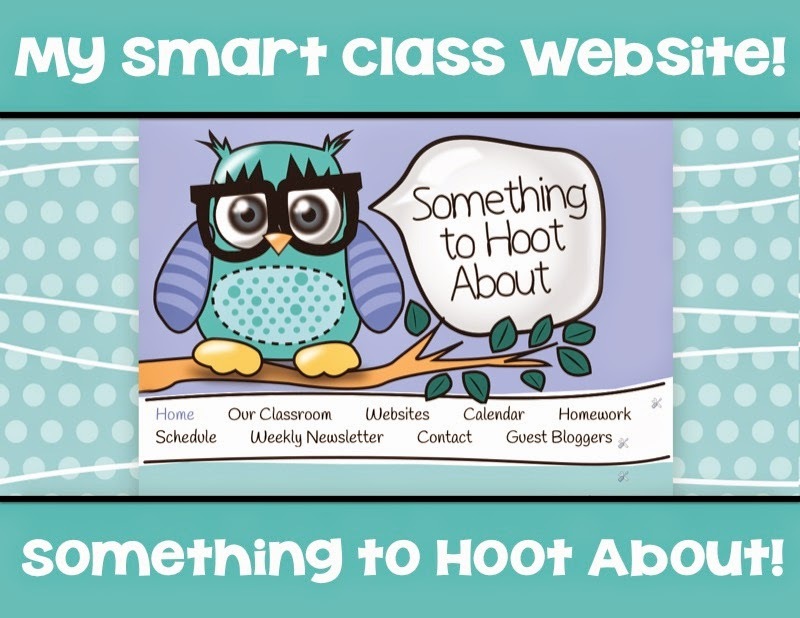 Could you use a Smart Class Website in your classroom? Tabitha is generously giving away TWO of her websites in our giveaway! In addition, she is offering 10% off of one of her Smart Class Websites with the code smartclasswebsite10 for the month of May! Be sure to also visit her at Flapjack Educational Resources. She has so many great products, ideas, and technology tutorials. Another great find this year is the Math Warm-Ups Kit! It comes from the Mountain Math/Language Company. About 12 years ago, when I first began teaching CA State Standards, I used Mountain Math and Mountain Language for my daily warm ups. Both were bulletin boards that I posted on my wall some years or in a pocket chart other years. The constant repetition of important concepts helped my students to master the standards. A few years ago we moved away from State Standards, so I stopped using Mountain Math and Mountain Language. I was excited to find out that the company makes a Common Core version! My Third Grade Math Warm-Ups board is below. 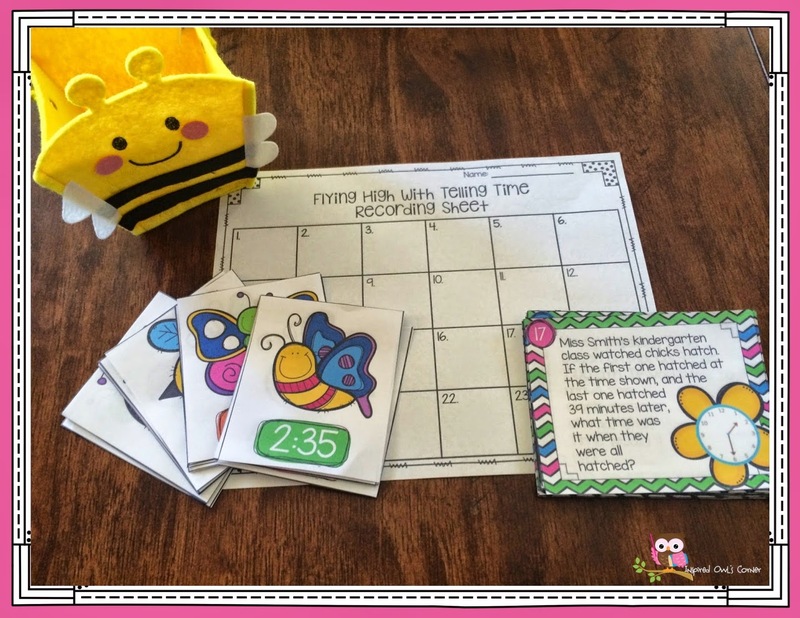 The set comes with enough double-sided cards for a whole year of review, recording sheets, and numbers for your bulletin board. I decided to post the warm-ups on my bulletin board. I used my own numbers, since brown was easier to see on my fabric, and made pockets from plastic I purchased at Joann's. Directions for making the pockets are included, or you can purchase those separately if you like. I assign students a few warm-ups to do each day. Most of the problems have more than one task for students to complete on the recording sheet. I keep that in mind when I assign the problems. Each day after the students complete their warm-ups, we discuss them and correct them. Below I show a few different ways I have used the recording sheets. 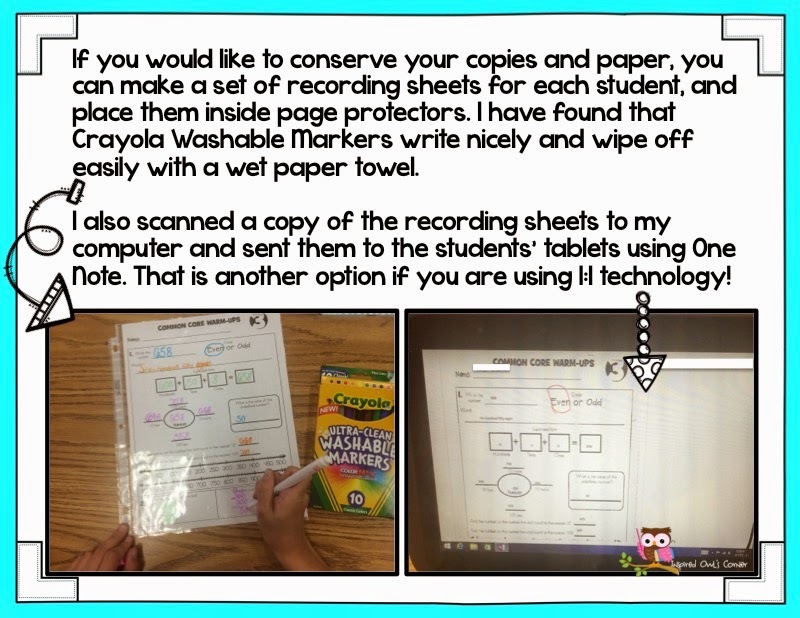 You can make copies each week, place them inside page protectors, or scan and send them to students' devices if you are able to. The weekly repetition of the important Common Core concepts is so important for mastery! I have seen my students improve so much in math! 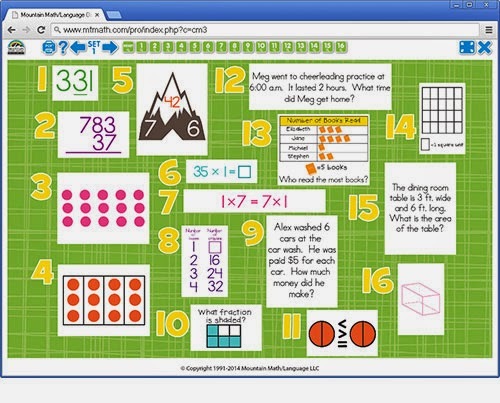 When we told Mountain Math/Language about our giveaway, they offered to donate a product up to $99.95 for each bundle! Lisa used the Common Core Centers in her class. Make sure to read her post to see how she uses them! Teaching a combo for the first time in my teaching career has been an wonderful experience. It's similar to teaching a straight grade, but different in many ways, too. One thing I figured out early on was to have extra activities prepped and ready to go for fast finishers so I could continue working with the other grade. Task cards are so versatile and have been a lifesaver for me this year! I have tried a few different ways to store my task cards this year. I started out with baskets like the ones shown below. 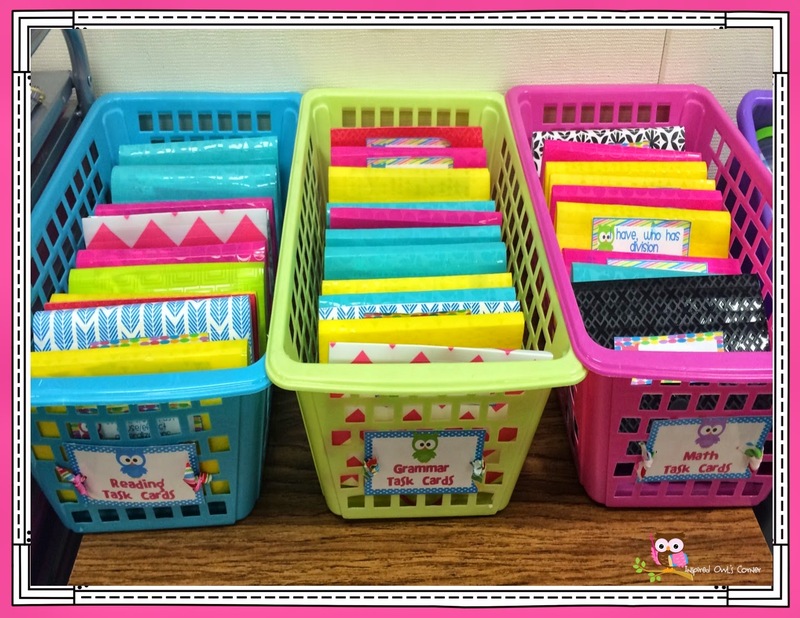 For me, these baskets and coupon accordion files work great for long-term storage, but I have found I need task cards ready for students to grab and go to their seats. I also like to give students the choice of a few different concepts at a time. I am not a fan of worksheets and busywork, and neither are my students. After students complete their independent work, they grab a set of cards and go to their seats. Other days, I post the cards around the room, and when students finished their independent work, they grab a clipboard and a recording sheet, and quietly go around the room and complete the cards. When everyone has completed the cards, we go over the correct answers. Presentation is everything! 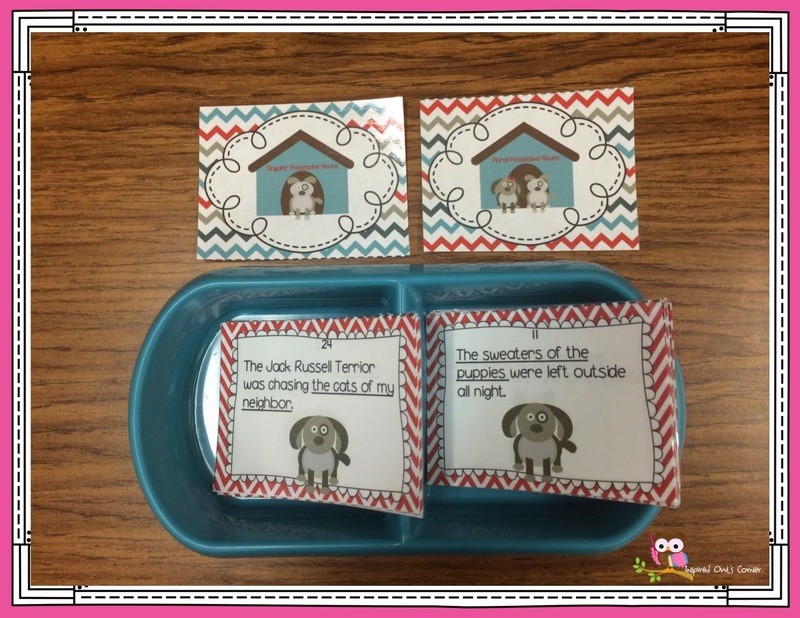 My students love the dog dishes and task cards. They go crazy over this stuff! Once I've laminated the cards, they will be useful for years. I love the look of the colored task cards, but I know not everyone has access to cost efficient color printers. Most of my task cards come in color and black and white. Black and white cards look great when printed on colored paper. 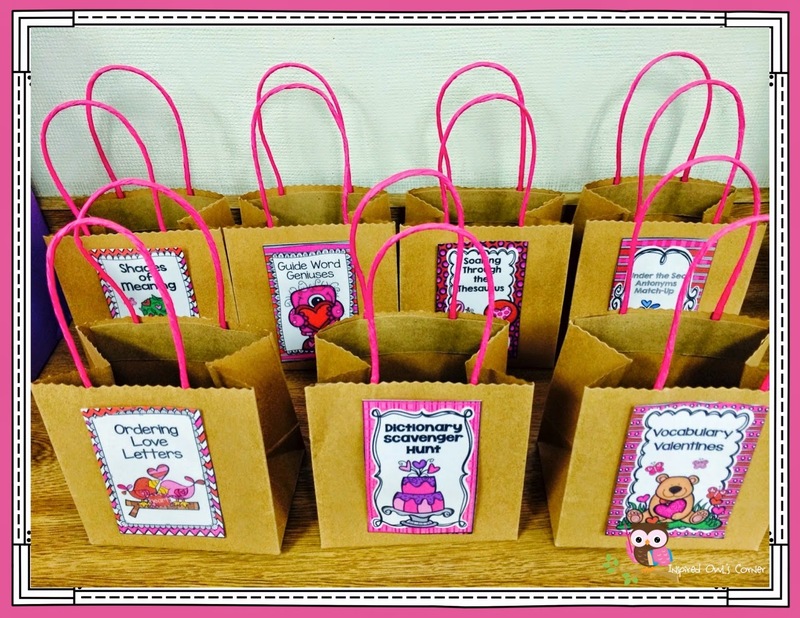 Having cards in small bags students can grab and take to their seats or to a designated place in the classroom makes it easy to prep and easy for them to grab. Target Dollar Spot and The Dollar Store have great small bags for this. I often have my students use a blank piece of paper folded into squares and record their answers on that. This eliminates the need for copies! I make sure to change out the cards by season and concept. The students become bored if the same task cards are constantly set out, so switching it up often is important.The cards show below are from PAWSitively Teaching. 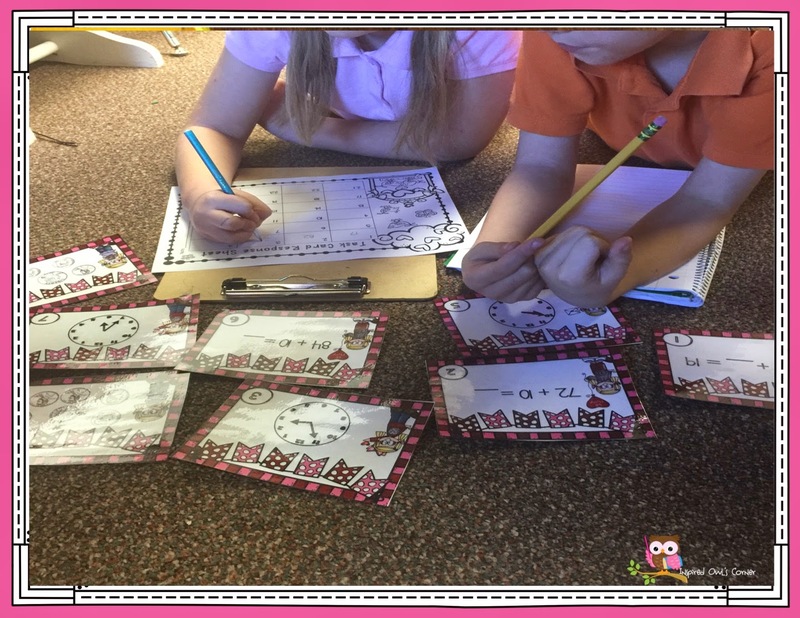 The kiddos love to work with partners or groups. At the beginning of the year I trained them how to quietly work together so I can continue to teach the other grade when they finish their work. Target always has the cutest seasonal felt bags and pails to distplay and store task cards. 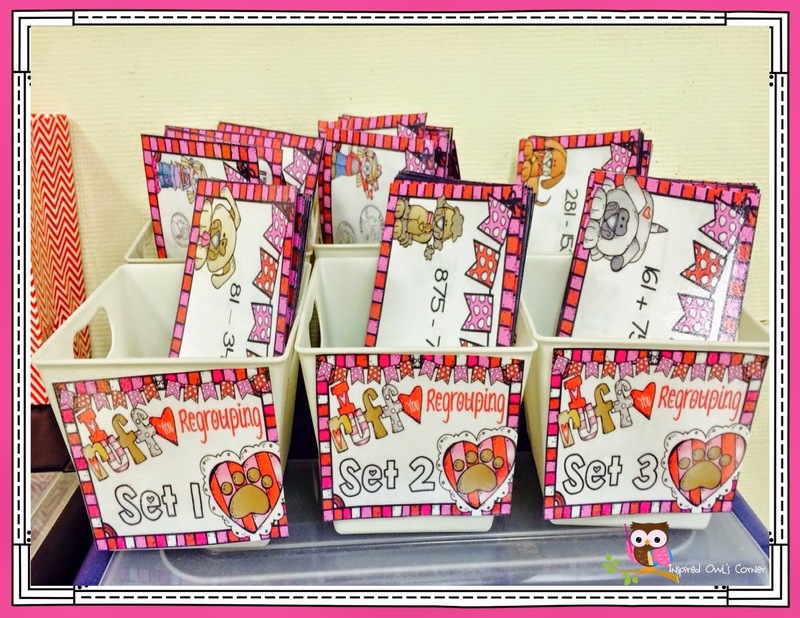 The simple act of putting the cards in a themed basket makes this set of task cards appealing to the students. Looking for more task cards? Here are my task cards, and there are a few FREE sets included! 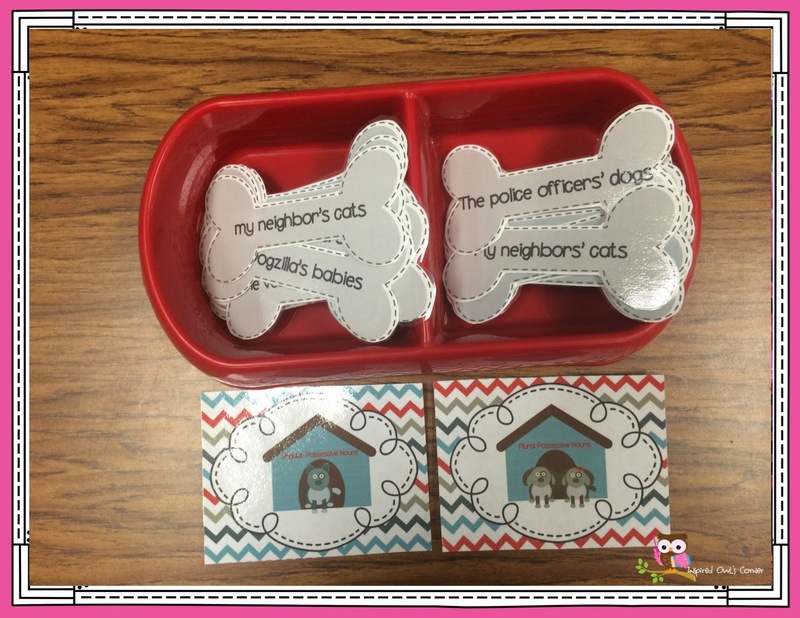 Be sure to check out PAWSitively Teaching's task cards Here! 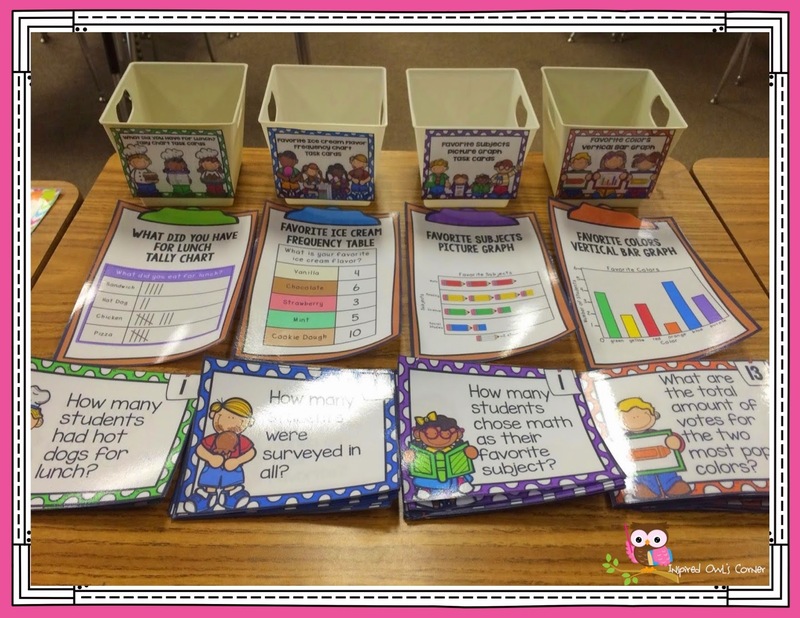 Be sure to see what works in the other bloggers' classrooms below! I can't wait to learn some new ideas! And now the REALLY fun part! 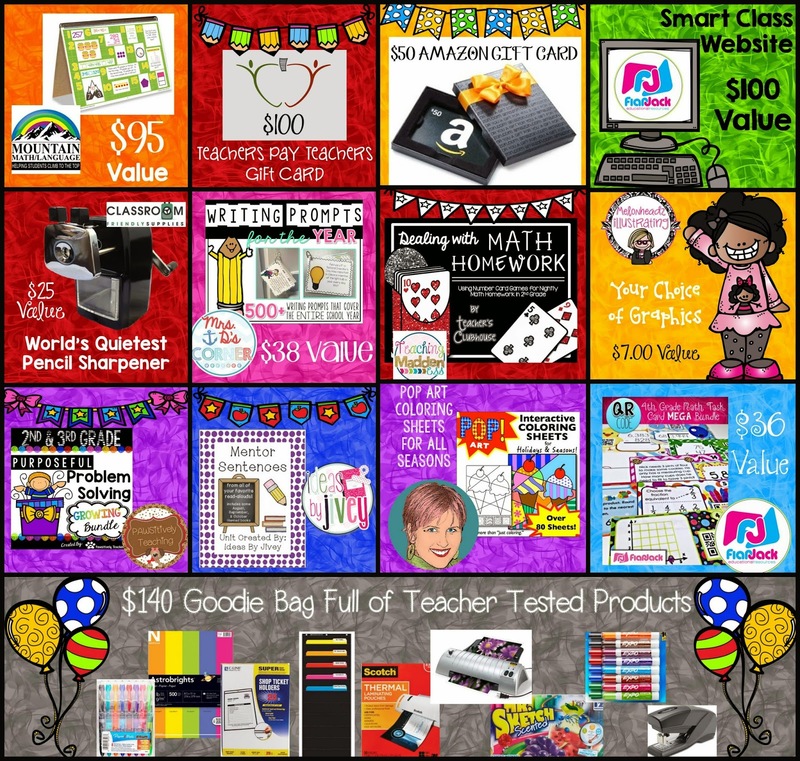 Our amazing giveaway! 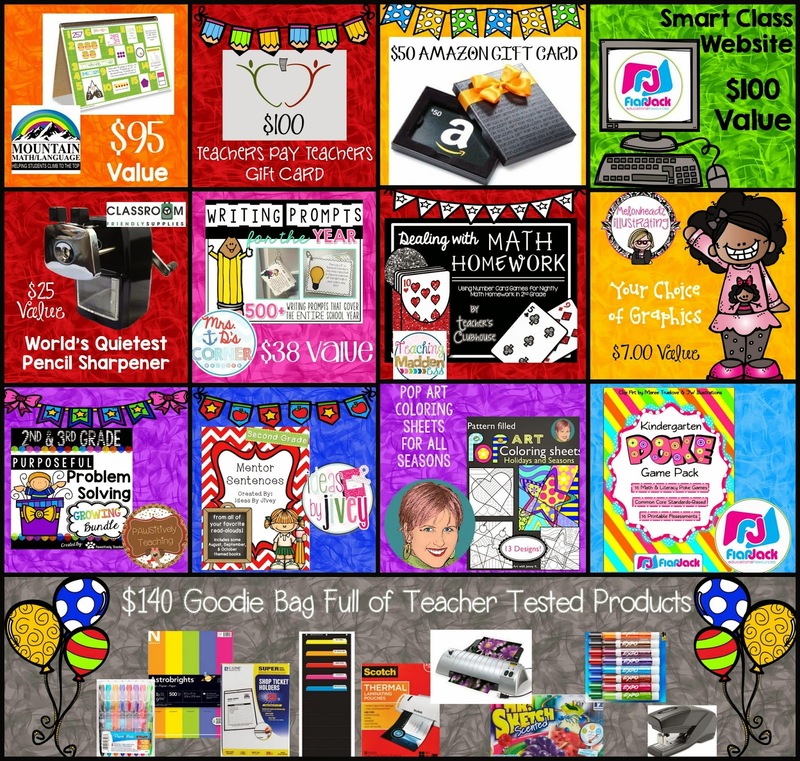 To celebrate Teacher Appreciation Week, we have put together two prize bundles! The more entries you have on each of the Rafflecopters, the more chances you have to win! Be sure to enter all of the chances to win by following all of the bloggers who contributed to the prizes! The more you follow, the greater your chances of winning! And be sure to enter both rafflecopters for a better chance at winning one of these amazing prize bundles! Good luck to you! I'm amazed by the parent websites! Thank you!! Your task card organization is awesome! What fabulous ideas!